The Sunshine Coast is home to beautiful beaches, stunning hinterland and fun filled attractions. Boasting year-round sunshine and a stunning waterfront location, situated only an hours’ drive north of the Brisbane CBD, you’ll want to call the Sunshine Coast home, both on and off-season. Take the opportunity to relax in one of our many beautiful accommodations available. View Sandcastles – Mooloolaba – Beach – RELAX! Ideally located on or near the Esplanade, overlooking the azure waters of Mooloolaba Bay. Our well appointed accommodation choices are right in the heart of Mooloolaba and are within easy reach of the vibrant café society, up-market dining precinct, boutique shopping, patrolled beach, surf club, galleries, Underwater World and major tourist attractions. 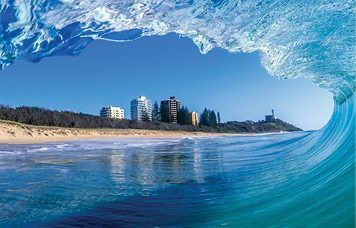 Affectionately referred to as Alex by the locals, Alexandra Headland is located between Mooloolaba and Maroochydore's main beaches on Queensland's Sunshine Coast. 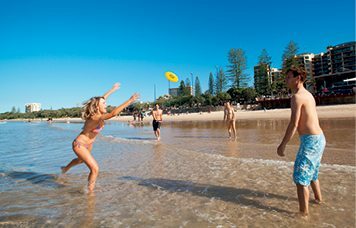 Fringed by golden beaches, protected waterways, national parks and the spectacular Hinterland Mountains, Alexandra Headland offers a relaxed and laid back holiday atmosphere. Buderim is placed on and around a volcanic plateau, barely 600ft above the Pacific Ocean. There is a green ambience characterised by leafy streets, lined with poinciana trees and flowering shrubs. 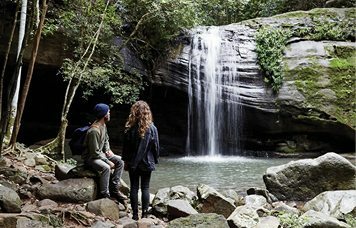 Major features are the Buderim Forest Waterfall Walk and Foote Sanctuary. Enjoy sweeping views of one of Queensland's major tourism centres and a mild climate all year round. This unique headland is surrounded by the Mooloolaba River to the north and the sea to the south and east. 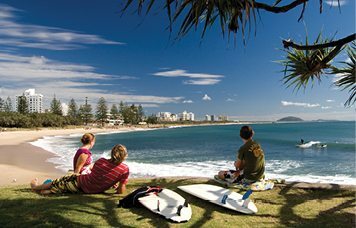 The grassy and rocky slopes feature relaxed walking paths and spectacular ocean views as well as views of Mooloolaba Marina . This is also a popular area for surfing and fishing. Dolphins and turtles can sometimes be seen offshore.